An Absolutely Stunning Mixed Amber Tree of Life Pendant. 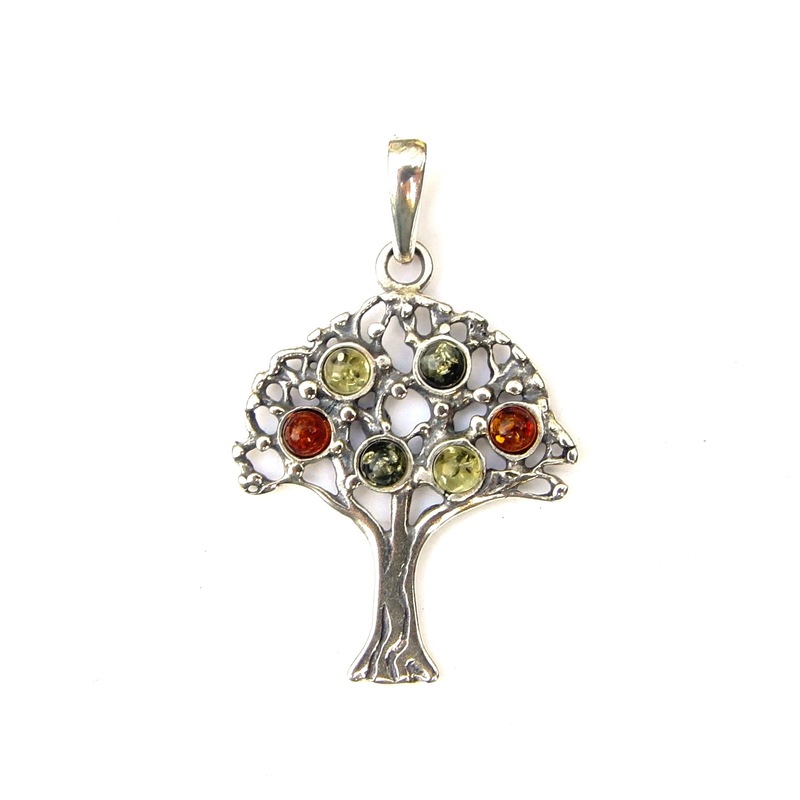 It is a Sterling Silver Tree with 6 Lovely Mixed Coloured Amber Cabochons set in it. It is 3 1/2cm long including its bale by 2 1/4cm wide Chains, also available. An Absolutely Stunning Mixed Amber Tree of Life Pendant. This Stunning Mixed Amber Tree of Life Pendants is a Sterling Silver Tree with 6 Lovely Amber Cabochons in mixed Amber Colours set within it. It is 3 1/2cm long including its bale by 2 1/4cm wide Chains, also available. This website is strictly for approved Wholesale customers only, if you are looking to purchase this Stunning Mixed Amber Tree of Life Pendant from a retail store, please visit Shooting Star. NEW ARRIVAL! This Beautiful Turquoise Tree of Life Pendant has an outer silver oval setting & within is twisted silver work to form the roots of the tree which comes up and branches out into a lovely tree. Threaded in the silver at the top are chips of Turquoise Crystal to form leaves. This is a really unusual design which is sure to be very popular. We also have a smaller size in stock and it also comes in Rose Quartz & Amethyst in both sizes. It is approx 2 1/2cm x 4cm incl Bale. Silver Tree of Life Large Pendant. This is a Lovely Tree of Life Large Pendant is Convexed to give a lovely Finish. It is a large Beautifully Detailed Tree in an outer circle, with a nice Bale. This is a Large Pendant and it is 2 1/4cm wide by 3cm long incl Bale. NEW ARRIVAL! Lovely Dainty 3d Cockerel Necklace. This Lovely Dainty 3d Cockerel Necklace has lots of amazing details and it is 3d & textured. Comes with a 18" Cable Chain. It is 2 cm including loop. Matching Earrings also in stock. NEW ARRIVAL! Beautiful Crystal Mermaid Pendant. This Beautiful Crystal Mermaid Pendant is sterling silver, she has a moving tail and has stunning Aqua Blue, Green & Yellow CZ Crystals set in her tail. Unfortunately the photo does not do her justice as she also has a very high polish. It is approx 4cm Long incl loop. Pretty Silver Shamrock Pendant. This Pretty Silver Shamrock Pendant has a lovely silver Shamrock with pretty Green Crystals set within it. Approx 1 3/4cm long including Bale. Matching Studs also in stock!